What I want to talk about on this page, Indonesian cuisine, is that there are a lot of health advantages that you can pull out of Indonesian food. It’s not only the fabulous taste what I want to discuss here but also the healing power of the spices that we use in Indonesian cooking. They are the greatest source of protein and vitamins that your body need to get a healthy life. Isn’t it a good feeling to know that Indonesian food is not only great in taste and smell but also good for your health? As you’ve already know that vegetables and fruits have a lot of health benefits but there are also a lot of things that the spices can do for your health. Spices such as ginger, garlic, shallots, turmeric and other ingredients that we used in Indonesian cuisine have incredible healing power. The variation of Indonesian cuisine is endless. There are thousands of them. Each province of Indonesia has different cooking style. Even in the island of Java there a lot of difference style between the provinces. While in West Java the style is spicier and salty, east and Middle of Java has more sweet taste. 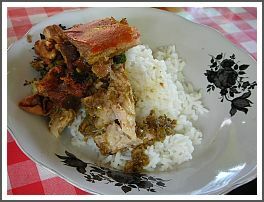 Balinese cuisine in other hands has their own style. 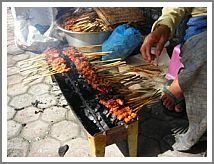 The favorite and popular food in Bali is babi guling (crispy and spicy suckling pig) and chicken or pork sate. You can’t compare one place with another. They own their specialty. It’s certainly a pleasure to taste all the difference. Indonesian cooking technique has many influences from another country such as India, China, Middle East and Europe such as Portuguese and Spanish, and also the Dutch which rules so many years in Indonesia. Chinese cuisine makes also an important part of existing Indonesian cuisine today. There are a lot of dishes that you’ll find in the cities of Indonesian that came from China, such as Foe Yong Hay, (egg omelet with vegetables and tomato sauce), noodles, and much more. They are very popular throughout Indonesia, sold by street vendors and restaurants. The old fashioned and traditional Indonesian cooking is still exist until today. You can still find it in many Indonesian places and villages that we are still cooking in the old fashion way. In many urban places where no modern accommodations are, you’ll find the simplicity of Indonesian cooking. They are delicious in their own way with not too many details, but you can simply endless enjoy it. Those spices that you can find in Indonesia right now in this day are not completely originated from Indonesia. They came from different places. There are several original spices from Indonesia, such as Pala (nutmeg), cengkeh (clove) and Laos (galangal) originated from "the spice island" Maluku, Sulawesi. Other spices? well surprising enough there aren’t native Indonesian spices, they were introduced from India, such as black pepper, kunyit(turmeric), sereh (lemongrass), bawang merah (shallot), kayu manis (cinnamon), kemiri (candlenuts), ketumbar (coriander), and asam (tamarind). The fame ginger and garlic use often in Indonesian food are originated from China. Those spices make Indonesian cuisine as today, delicious, healthy and irresistible. Other ingredients such as chili pepper and coconut are also important parts of Indonesian food. The origin of coconut tree is pretty unknown. We use coconut in many dishes, such as rendang, opor ayam, laksa ayam, or even for desserts such as cendol and mung bean porridge. Coconut is also the big source of many nutrient healths. Chili peppers are the main ingredient to make sambal (spicy chili condiment) but we use them also in many hot dishes such as ikan bumbu Bali (spiced Balinese fish). Chili peppers are hot and it can burn your tongue, but I suggest you to use them in your daily food, because they are extremely healthy. They can even fight cancer. So, can you imagine what Indonesian food can do for your health? It’s truly beyond description. And not to forget, they are delicious. Start today with practice a lot of Indonesian cooking and you will get much profit for your health and for your taste buds. Are you going often to the restaurants to enjoy your favorite dishes but you can’t do it anymore for some reason? Why don’t you try to make it by yourself? Learn the secret recipes and cooking techniques from your favorite restaurants. Especially if you have little children, sometimes it becomes difficult to eat out with them. You can’t really enjoy the food because you have to keep an eye of them all the time. While if you making these recipes at home, beside that you have satisfaction that you can make quality restaurants recipe with success by your own, you can fully enjoy your delicious meal without too much worry because your children are home at their best place.